Home » squirrel shocking bird feeders » Electric Squirrel Proof Bird Feeder - Shock the Squirrel! Unlike previously reviewed electric spinning squirrel proof bird feeder that gets rid of the squirrels by spinning them off, the feeder that's about to be reviewed here utilizes electric power in very different way... and I bet you can guess how it works from the title of this review! The "Wild Bill's 8 port squirrel-proof feeder" gives squirrels tiny and absolutely harmless electric shock that's rather unpleasant than painful, but it's informative enough so that the squirrels understand clearly they are not welcome at the feeder. After several attempts to reach the food and experiencing static each and every time they hop on feeder's metal surface, the "critters" will finally withdraw for good as they actually get trained to avoid the feeder in the future. It's also important to underline that the birds are not objects of electric shocks because they are smaller than the squirrels and not able to trigger the closing of battery powered electric circuit. This would be basic concept of this anti squirrel feeder and now let's see more in-depth features review. 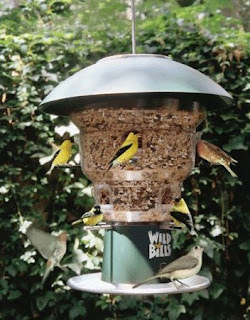 "Wild Bill's 8 port squirrel-proof feeder" looks pretty much like classic outdoor lantern so it easily fits in almost any garden decor. Wide upper tray is dome shaped in order to protect the bird seed from snow and rain, while the lower tray comes convenient as a birds resting place. The dimensions of the feeder are 18"x15" (height and width) and the food reservoir may store up to amazing 14 lbs of bird seed so the frequent refills are not necessary. The reservoir has total of 8 feeding holes with according perches so that the birds can easily find a place to stand on. You can this feeder on shepherds hook or on tree but you can also mount it to a pole - the choice is all yours, but the pole is not included in this feeder part list. The inside of the feeder features local electric grid made of wires attached to feeder metal parts. Of course, we are talking about low voltage (9 V) alkaline battery powered circuit. Without any knowledge about AC/DC stuff, the squirrel will step on the feeder and of course touch the metal parts of it. And when the squirrel touches two separate metal surfaces (i.e. plus and minus battery poles) - that's when the GANGNAM style dance starts! The static chases a squirrel away from the feeder and after several attempts the squirrel will go away. Of course, this low voltage is completely harmless for the squirrels health. Where to buy Wild Bill's electric squirrel-proof feeder? I suggest you should check this Amazon.com link first because of the occasional discounts. Also, please make sure to have a look at the other reviews of this feeder.